← OK, I’ll trust you…if you think God is watching. The new research in question comes from a scientific article published in Media Psychology this month, titled “A Story About A Stupid Person Can Make You Act Stupid (or Smart): Behavioral Assimilation (and Contrast) as Narrative Impact” (PDF available at the link). But before getting into a discussion about this study (and the MSNBC article about it), I first need to explain the findings of two famous studies that were conducted by Ap Dijksterhuis and colleagues back in 1998. These psychologists sought to answer one simple question: When we think about stereotyped social groups, are we then “primed” to act in accordance with these stereotypes? Essentially, will thinking of Jersey Shore cast members make us act as dumb as they do? It was a simple question with two completely contradictory answers. In this particular study, participants were primed with the concepts of either “professor” or “soccer hooligan” (priming in this case means that the participants were told to write for five minutes about the lifestyles, characteristics, and general traits of these people), and then tasked with answering a series of Trivial Pursuit questions. Those who had been primed with “professor” did a significantly better job, while those primed with “soccer hooligan” did worse, therefore supporting the idea that these stereotypes were activated in people’s brains, and people then behaved accordingly. Sure enough, when people were primed with “professor” or “supermodel,” those primed with “professor” did better on the Trivial Pursuit task, while those primed with “supermodel” did worse. The participants primed with specific people, on the other hand, showed effects similar to the Hitler study: Those who were primed with Einstein did significantly worse at answering the trivia questions, while those primed with Claudia Schiffer did better. These effects, otherwise known as assimilation and contrast effects, have been established, validated, and well-known in social psychology for a while. When you prime general concepts, people act more in line with those concepts. When you prime specific, extreme exemplars (like Hitler or Einstein), people compare themselves to those extremes, realize that they come up short, and act less in line with the concepts that they embody. Returning to the present day, my background knowledge about this research made the MSNBC article especially confusing (and infuriating). Based on the logic of assimilation and contrast effects, one would expect that thinking about “reality TV stars” would make someone perform worse on a Trivial Pursuit task, but thinking about (or watching) specific, extreme exemplars, like Snooki, should prompt a contrast effect that would actually make a participant do better. So where exactly did the flawed logic in this MSNBC article come from? Did the fault lie with the journalist, or with the study authors? First, we need to look at what the new paper in question actually did. In the new Media Psychology paper, the researcher, Markus Appel, asked participants to read about the delinquent behavior of a “soccer hooligan” named Meier and then answer Trivial Pursuit questions. Yes, this seems eerily similar to the studies that were already conducted 15 years ago — down to the identical use of the phrase “soccer hooligan.” But, in contrast with the earlier Dijksterhuis studies, Appel changed three crucial things. First, rather than ask participants to write about the target prime for five minutes as the Dijksterhuis team had done, the participants simply read about the character and his behavior. Secondly, the author claimed that he was using an “exemplar” (i.e. Meier), yet he was not replicating Dijksterhuis’s contrast effects when participants merely read about the hooligan-ish Meier. And thirdly, to successfully obtain a contrast effect, Appel proceeded to explicitly direct half of the participants to focus on all of the ways in which they differed from Meier. Essentially, this paper ended up showing the same thing that the original Dijksterhuis studies found. When the participants simply read about Meier, they did worse on the Trivial Pursuit task. When they were instructed to contrast themselves with Meier and focus on all of the ways in which they were different from him, they did better. Appel argues that his study shows that we do not naturally engage in contrast effects after all, since the contrast effect was only present in his study when participants were explicitly instructed to compare themselves with the character, and those who merely read about Meier behaved more in line with his stereotype. But…here’s the thing. The exemplars in the original studies were Claudia Schiffer (who, the authors explain, was considered to be the “ultimate” example of a supermodel in the Netherlands at the time), Albert Einstein, and Hitler. HITLER. Herr, Dijksterhuis, and colleagues hammer in, over and over, how important it is that the individual people used to obtain contrast effects truly be EXEMPLARS of the traits that you are seeking to test. In this new study, who is Meier? Meier seems pretty dumb, admittedly. But is he as dumb as Hitler is hostile? Is he as dumb as Einstein is smart? Are participants walking into the study with a lifelong mental association between Meier and “dumb” akin to the lifelong mental associations that they would have had between Hitler and “hostile” and Einstein and “smart”? Frankly, I have my doubts. It’s clear that there are already issues with Appel’s classification of Meier as an “exemplar.” I would argue that Meier isn’t “exemplary” enough to encourage a contrast effect, so it makes perfect sense that unless participants are explicitly directed to contrast themselves with him, they would exhibit tendencies to adopt his stereotype, much like the participants who were primed with “professor,” “supermodel,” or “soccer hooligan” in the original studies. But then MSNBC decided to cover this paper, and things got even worse. In Appel’s defense, he never, at any point, mentions Jersey Shore in his article. This comparison was entirely due to the creative license of the MSNBC journalist. As far as I can tell, the logic behind the journalist’s “Jersey Shore Makes You Dumb” argument came from the idea that simply reading about Meier led participants to do worse on the task, and that the Jersey Shore cast seems to act a lot like the fictional Meier, so therefore people watching Jersey Shore will become dumber. This is where my big issue with the article comes in. Meier may have been called an “exemplar,” but as I’ve already mentioned, let’s not fool ourselves into thinking that our mental concepts of this fictional “Meier” character are so inherently, strongly tied to “stupidity” that reading about him would encourage a contrast effect in the same way that Einstein, Schiffer, and Hitler do. But you know who might be a strong exemplar of dumb reality TV stars, one with an association so strong that it might actually encourage a contrast effect? SNOOKI. Which means, and I will reiterate, there is no scientific reason to believe that watching the Jersey Shore will make you dumb. In fact, psychological research would actually suggest the opposite. So, right off the bat, the MSNBC article blatantly ignores prior research on the contrast effect (which, I will mention to Appel’s credit, was cited extensively and accurately in the Media Psychology paper). But oh, there is still more wrong here. I’d also like to call attention to one very important part of the Media Psychology paper that was clearly misread: THE TITLE. Note that the title says that a stupid person can make you act stupid (or smart). It doesn’t say that it will actually make you stupid or smart. And there’s a very good reason for that. Effects on performance, specifically improvements, are obviously constrained by objective limitations (e.g., it seems unlikely that one could all of a sudden play the violin merely upon hearing Beethoven’s Violin Concerto in E), but given natural within-person variations in task performance over time, theoretically, perceptions or mental representations of superior or inferior performance may have corresponding effects on the person’s performance. Thus, if one is a reasonably skilled violin player, one may indeed play better after hearing Beethoven’s violin concertos (Dijksterhuis & van Knippenburg, 1998, p. 867). No one has ever claimed that merely thinking about smart people will magically implant previously-unknown trivial knowledge into your head, nor will thinking about dumb people make the knowledge that you have go away. Rather, exposure to certain concepts may activate mental associative networks that result in subtle effects on how you access, utilize, and manipulate already-existing related abilities. So, as Dijksterhuis and van Knippenburg note, being exposed to the concept of “professor” might prompt you to “allocate [your] effort differently…use smarter and more varied strategies for problem solving [by strategically using pre-existing knowledge to successfully eliminate multiple choice options that you know are wrong]…[or] have an altered ‘feeling of knowing,’ which may result in a different use of [your] own knowledge” (Dijksterhuis & van Knippenburg, 1998, p. 874-875). Conversely, being exposed to the concept of “hooligan” (or, theoretically, “reality TV star” or “Jersey Shore resident”) might temporarily cloud your judgment, make you lose confidence in your talents, and generally impede your ability to effectively problem-solve. In other words, when something activates the concept of “intelligence” in your brain, it might push you to think about things differently, utilize better problem-solving strategies, or simply feel more confident, which might then make you better able to access knowledge that you already have and correctly answer trivia questions. But no, reading about professors will not “make you smarter,” just as watching Jersey Shore will not make you dumber. Not for any reasons based on psychological research, at least. No discussion of contrast effects. No understanding of the psychological mechanisms. No nuance. And a conversation that revolved entirely around the Jersey Shore, when those two words were never even mentioned in the original article. The graduate student in me felt angry. The science journalist in me, who really wants to see scientific findings being conveyed interestingly yet accurately to a lay audience, really just felt sad. The original paper had nothing to do with the Jersey Shore. The original paper didn’t even suggest that the Jersey Shore would represent a good example of the finding. The Jersey Shore was actually a terrible example to illustrate the real finding. In reporting on the article, the finding came second to sensationalism, and readers were left with no idea what the finding actually was. This is not what I want science journalism to be. Since originally posting this, I have found several other links discussing this study. Well, sort of. Here are two such links: Newsflash: Watching “Jersey Shore” Could Make You Stupid… and Watching Jersey Shore Could Make You Stupid. These “journalists” have taken irresponsible reporting even further than I had originally feared; they seem to have made up their own study in which “focus groups” either did or did not watch Jersey Shore or not and then did worse on tests of general knowledge. Please note that this is in no way what happened in the actual study. You know, the one where participants read about the soccer hooligan named Meier. 1. Poor Claudia Schiffer. She seems like a nice woman, and I loved her cameo in Love Actually. I really hope she doesn’t know about this study. Appel, M. (2011). A story about a stupid person can make you act stupid (or smart): Behavioral assimilation (and contrast) as narrative impact. Media Psychology, 14, 144-167. This entry was posted in Social Psychology, TV Shows and tagged Commentary, Norton, Science Writing, Social Cognition, Social Self, TV Shows. Bookmark the permalink. Well Said. I second your feelings of sadness over witnessing such bad science reporting. Hey! 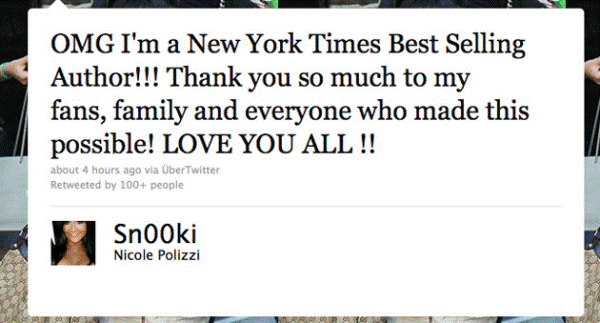 Snooki can’t be the exemplar of dumb http://www.prosebeforehos.com/wordpress/wp-content/uploads/2011/07/snooki-new-york-times-tweet.png she’s a new york times best selling author! I however disagree with your analysis. Don’t get me wrong, I agree that they are taking the study and treating it as it it’s physically dropping lowing IQ and doesn’t take into account that all it does is wires peoples actions. I just disagree that you state that Snooki is an exemplar of ‘dumb’ as a fact. Perhaps people like myself who couldn’t bring themselves to watch an episode nor spends the time to be engrossed in tripe of the show views them as the epitome of the worse traits of human intelligence (or lack there of). However I highly doubt that people who watch the show view snooki or the rest of the case as such. I think the exemplar of dumb would more likely be someone who is mentally handicapped seeming that is a physical realisation of lowest intelligence possible. I mean comparing the dumbness of snooki to the genocidal hostility of Hitler is a bit of a stretch. Perhaps I’m not reading into this right and you more wrote that for comedic effect. Thank you for your comment. I understand what you are saying, but I must respectfully disagree in return. Regarding the Snooki/Hitler comparison, I’m not sure if this is what you are implying in your last paragraph, but I am in no way trying to say that Snooki’s dumbness is “as bad” as Hitler’s hostility, or anything like that. There are no “[Fill-In-The-Blank] = Hitler” comparisons going on here. All I am saying is that when past exemplar studies have been run, they have used extreme examples like Hitler for hostility (or, for that matter, Einstein for intelligence). The last “exemplar” study that was run involving intelligence used Claudia Schiffer as the exemplar for “dumbness” — not because people necessarily thought that Claudia Schiffer was AS DUMB as Hitler is hostile, or even that she was even particularly unintelligent at all. She was chosen because it was a commonly held stereotype that supermodels = dumb, and she was a very famous, well-known example of a supermodel. The importance of an “exemplar” is that this person be someone, usually famous, who is highly identified with a given trait OR with a stereotyped group of people. The concept of “supermodels” elicited an assimilation effect, but mentioning a specific, famous supermodel (Claudia Schiffer) elicited a contrast effect because she is a famous, singular supermodel. To that end, I see no reason why Snooki should not be as much of an “exemplar” for unintelligence as Claudia Schiffer was back in 1998. If people today hold a stereotype that “reality TV stars = dumb” much like they held the stereotype that “supermodels = dumb” in 1998, then priming the (arguably) most famous reality TV star now should have the same effect that priming the (arguably) most famous supermodel did then. In fact, I would hypothesize as well that simply priming a “mentally handicapped seeming” person (as you mention) would cause an assimilation effect, not a contrast effect (because that person would not be a famous, highly identifiable “exemplar”). However, we may still agree to disagree on this, and that is okay as well. After all, that’s the fun of interpretation! So watching Jersey Shore won’t make you dumb. I think the study is missing the target. You have to be stupid to watch Jersey Shore. Lets see the results of that study. Sure, but the original study was not designed or run to prove a point about Jersey Shore. If someone wants to test that hypothesis, they are more than welcome to do so on their own. I do agree with that, but I think that, although these things dont make you dumber, by direct lowering your IQ and such, they will, instead, dumb you in a indirect way. If you get emotionaly involved while watching these shows (or any other television program), for example, your critical mind will not be exercising its functions most of the time, and then everything that is being presented to you will be eventually absorbed by your mind. Now, when it happens, the ideas, values, concepts, etc., that are inserted in the show will exercise influence on your behavior and, because of that, you will get dumber, once verything that is presented on these reality shows, be it ideas, values or whatever, are far alway from inspiring an intlectual pursuit on the viewer. In fact, they will be only complacent with nothing but mediocrity, and will tend not to seek any intelectual stuff. I can’t really offer any informed opinion on that hypothesis. The original claim was based on a study showing a direct prime-to-behavior effect, where being reminded of “dumbness” leads you to be dumber immediately after. Your hypothesis sounds interesting, and I wouldn’t be surprised if watching dumb TV all the time instead of doing more intellectual activities has a negative effect, but I don’t know of any long-term research showing anything like that, so I can’t really scientifically confirm or deny it. I think that, though obviously the basis for the other articles was pretty flawed, watching Jersey Shore still makes you dumber. I don’t think that it makes you dumber in a “trivial pursuit” manner at all though, but at the very least more prone to react in an idiotic manner when one finds themselves in similar situations as the delightful (yes, that’s sarcastic) characters of Jersey Shore. Not only this but I know for a fact that of the people I know who watch the show obsessively, almost all of them mimic the lifestyles of these people in everyday life. I think that in that respect this show promotes some sort of modern-primitive behaviour where the people who watch the show feel a desire to live for the things presented in the show. Generally this show is targeting high school kids and young adults, and it is basically giving them examples of how people who are, by modern western terms, in ideal lifestyle situations (financially well-off, attractive, etc) behave and so I think that it is, whether people watching think the show is stupid or not, promoting this sort of behaviour. Also, if you look at the trends in popular reality shows like this you’ll notice that in the past, it was mainly scripted soap operas that people watched for their fix of drama and all that. These shows would be filled with drama, yes, but most of it would be hidden drama – things that weren’t out in the open to the whole cast and because of this I think that it promoted the trend in people watching it to not put their drama out in the open and as a result, gave them more time to think about it before having to act on it. Fast forward to today and we’re presented with great pieces of art (sarcastic again) such as Jersey shore, Laguna Beach, The Hills, etc. THESE shows however, show the characters (almost always extremely snobby, completely ignorant of anything in the world other than “high-class” living, and pretty much devoid of any redeeming qualities) CREATING drama rather than responding to it and not only this but they almost always have everything out in the open. They sit there in their million dollar homes drinking alcohol and gossiping day in day out. At night they get more drunk, head to various night clubs, and exhibit behaviour that most monkeys would look down on. They are pretty much completely being controlled by primal urges to mate or fight or a combination of both. I’m sure by now I’ve made my point. Though people watch these things and still believe the characters to be exemplars of stupidity as you say they do, it still is depicting humans doing these things and so consciously or not the bar is lowered and standards for human behaviour slowly degrade. I’ve seen it happen, and more and more we see the self-centered, self-absorbed behaviour of teens and young adults worsen. It’s pretty alarming.